I had a craving this morning. And no, before you ask, I’m not pregnant. I had a craving for good old-fashioned chewy choc chip cookies. So, naturally, I went onto the internet in search of a good recipe. Here was the source of my mis-adventure. So I searched on Foodgawker, and selected a bunch of delicious and chewy looking recipes to look at. I wanted something simple, just with chocolate chips, so I closed all the ones that had nuts or oats or peanut butter or salted caramel or cranberries or raisins. I closed all the ones which were egg/dairy/gluten/sugar/salt/cholesterol/whatever free, and closed the ones for which I didn’t have ingredients (I am not leaving the house today. That would require a certain level of kempt-ness that was beyond the scope of my effort levels today). As I was reading & closing recipes, one thing stood out to me like a hamantash in a row of kourabiedes. It is a total cop-out for anyone professing to be a so-called “food blogger” to publish recipes touted as the best/chewiest/tastiest/moistest/amazing cookie recipe when a significant portion of the “ingredients” are a commercialised replacement of a once-traditional foodstuff, like “pudding” (which, as far as I can gather, for Australian audiences is most similar to our cartons of custard. So imagine that, but in power form.). It is an insult to real cookery masters everywhere to pass these kinds of short-cut recipes off as the bees knees of cookie recipes, and do you know what the really sad thing is? New cooks make these recipes and it shapes their understanding of home cooking from then on! These new cooks, these unwitting victims to short-cut cooking, have no concept of the skills, guts, and sheer brilliance of traditional do-everything-from-scratch cooking. And that really saddens me. Yes, I take shortcuts. Yes, I make my chicken laksa from store-bought laksa paste. But, combined with my homemade chicken stock, homegrown herbs and vegetables, my laksa still possesses a lot of the traditional elements authentic laksa has, and furthermore, my desire to learn how to make my own flavour pastes is just waiting for when I have enough time to dedicate a day or two to learning how to do it. You have read before on this blog about my love of the long way round to gastronomical bliss, and when I eventually learn how to make my own flavour pastes I know this will open up a whole new world to me. But I digress. So I made my feelings known to the whole of Twitter (with liberal use of the exclamation mark and the rage hashtag), and I was not prepared for the overwhelmingly positive outpouring of support of my statement. 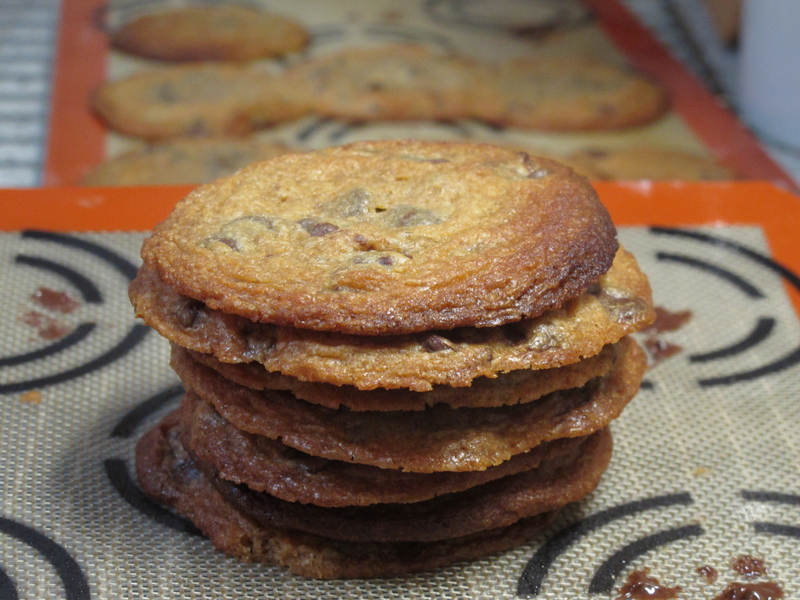 I made the pleasing discovery that I was amongst like-minded people, and was blown away by all the offers to share their tried & true choc chip cookie recipes. My #rage quickly subsided, and I went about choosing the recipe that I made this afternoon. This recipe was generously given to me by my knitting friend Sheralynn and with her permission, I am going to share it will all of you lovely readers. 1. Cream butter and sugars, add egg and vanilla and combine. 2. 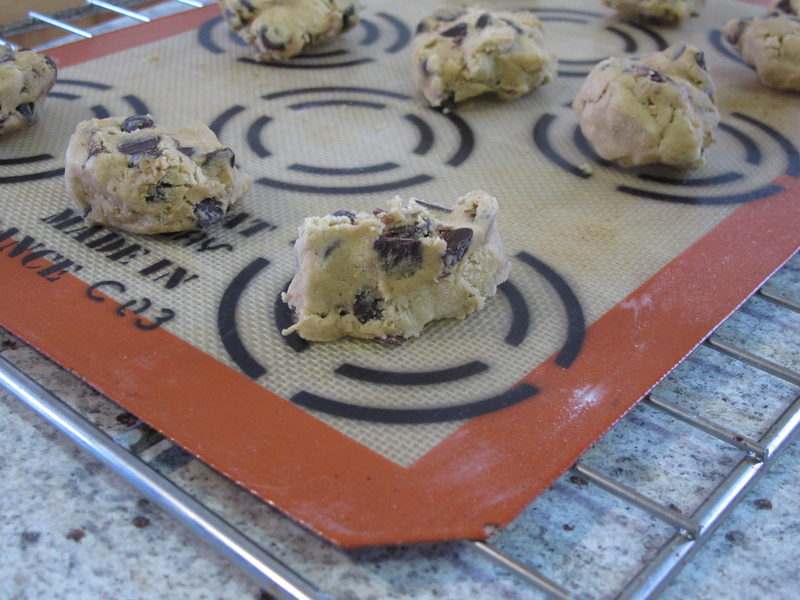 Sift in flour & salt and mix, then stir in choc chips. 3. Roll into a long tube about 1-2 inches in diameter and wrap in saran/glad wrap. Chill the log of dough for at least 1 hour in the fridge. 4. When ready to cook, preheat oven to 180oC and slice hockey pucks from the log, place on baking tray and bake for 7-10 mins. 5. Leave to cool on sheet until hardened then move to rack to cool. So I made these and they were delicious! Chocolatey, sweet, chewy, nom! The only little hiccup I had was when chopping the log into “hockey pucks” (I just love this term) they didn’t hold together very well, and I think this was because I was using chocolate chips that were a bit on the large side, and the knife couldn’t cut them easily. But it didn’t matter, I just pressed the mix back together for each cookie. Also, one of my Silpats made the cookies stick, but the other didn’t. I’m not entirely sure why! So, what have we learned today? I have learned that blog sites are sometimes not all they are cracked up to be. I have learned that twitter friends are amongst the bestest friends one can have. And I have learned that there is at least one recipe that I want to try on a different day, for it requires some pre-bake planning. I have also learned that while the cookies might be mangled from getting them off a sticky Silpat, they are still delicious! This entry was posted on May 31, 2011 at 6:40 pm and is filed under Personal, Sweets. You can follow any responses to this entry through the RSS 2.0 feed. You can leave a response, or trackback from your own site. I agree 100%. I can’t stand and avoid all recipes with any such shortcuts. If you’re going to cook, then cook!! The amount of crap that goes into those packet products – they aren’t actually food at all. Just a lot of chemicals. (This is one of my favourite topics to rant about ….). I’m the same as you with curry pastes. I try to get the ones with the most real ingredients in them, if you know what I mean & have ben known to attempt to make my own, but they never really turn out as I hope. And it goes without saying that I have to make my own stock, if for no other reason that it tastes so much better.